Yesterday’s leak, and a cheeky confirmation from Ubisoft, revealed that the next Assassin’s Creed game – Assassin’s Creed Odyssey – will be set in Ancient Greece. Beyond that, the publisher is keeping quiet until its E3 showcase. But that shouldn’t stop us guessing, should it? Jeremy and Jules are hoping that it will instead go the route of Far Cry: Blood Dragon, a less serious, non-canon, spin-off version of Assassin’s Creed Origins. One that sets the new game in the world of Ancient Greek myth and legend. Want an open world you can play in right now? Try one of the best sandbox games on PC. For a more serious take on Assassin’s Creed Odyssey, Matt’s been pulling together different threads – including the lore of the last game, and other rumours and leaks – to make his best educated guess at what Odyssey will be like, but building from the assumption that this will be a full-throated sequel to Origins. Jules: So, Jeremy, as the two people on the team who have played some Assassin’s Creed games and read at least some books, we are truly qualified to pitch a spin-off in the style of Blood Dragon for Assassin’s Creed Origins, one that is set in the world of Greek myth. Jeremy: The Odyssey is the obvious ledge to leap for, isn’t it? Even the new Mario managed to nod to the classics with its journey between lands, although – spoilers! – it didn’t conclude with the plucky plumber murdering a room full of Peach’s suitors. Jules: There’s always room for DLC. So would you like to play as Odysseus in this spin off? Jeremy: I mean, his story actually sounds a little like an Assassin’s Creed plotline, at least in the broad strokes. It takes place over a ten-year period, which allows for all that time-hopping Ubisoft like to do in the first act. 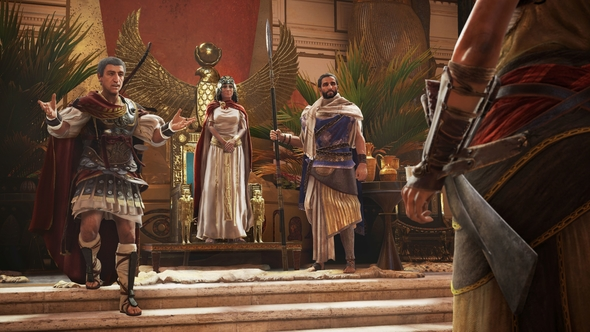 And there’s a possibly doomed romantic relationship at the centre, between Odysseus and his wife Penelope, as there has been in more than one Assassin’s Creed of late. Jules: And it even has a dog sidekick: Argos. Granted, he’s an old dog who – spoilers! – dies the moment Odysseus returns home. 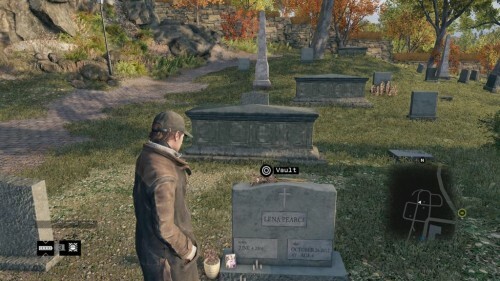 But at least then there’s room for some gravestone-hopping action a la Watch Dogs. Jeremy: Sometimes parkour is the only way to keep from crying. 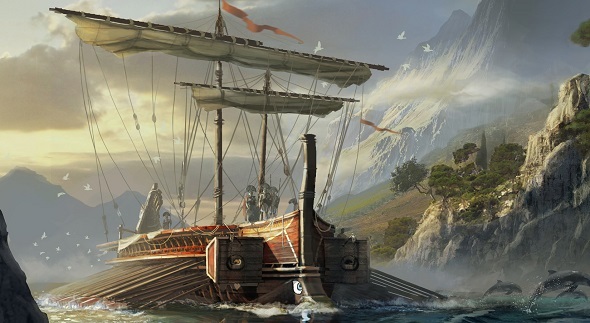 Real talk – everyone knows Assassin’s Creed is at its best on a boat, and The Odyssey provides ample boat time, being the story of a man who sails between islands, gradually losing his entire crew in a variety of outlandish and irresponsible ways. Jules: Whirlpools, cyclops, turned into pigs… they have a wild time. But it also works as an excellent structure for an open world. Imagine a map where every island you discover is fundamentally different because it has a central conceit pulled from myth. 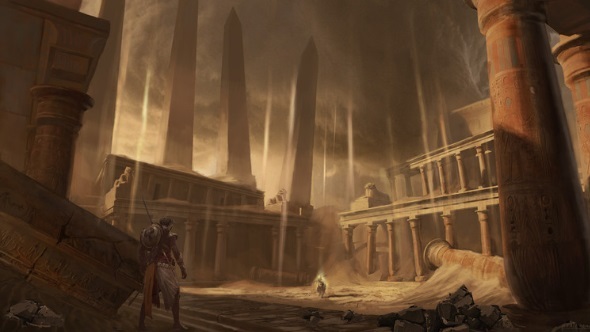 Some would be puzzle-led boss fights – the island of the cyclops, for instance – while others would be a Witcher-style mystery, like the island of Circe. Though, I’d love a game which didn’t stick strictly to Odysseus’s story, and let you encounter other characters and story from Greek myth. Imagine going into the Labyrinth, trying to reach the centre while being hunted by the Minotaur. Jeremy: Yeah, Assassin’s Creed has never had any qualms about throwing all the most interesting and famous people from a period across your path, so that could work. I’m excited for the potential for Assassin’s Creed to grant you mythical abilities, too, beyond the quasi-realistic gear that hamstrings exploration and combat variety in the series. In The Odyssey, for instance, there’s a bloke who presents our hero with a bag containing all the world’s winds. Imagine the mechanical implications of that: opening the bag to let out a gust that can carry you across the waves, like in Windwaker, or loosening the strings to send a barrage of physics objects crashing across the map towards your enemies. No one really believes a man can survive a dive off a cathedral spire into a hay bale, so why not lean into the silliness? Jules: More than that, the Mediterranean Ocean is full of dangers: Scylla and Charybdis, the Sirens, a pissed-off Poseidon – let alone, running across Aeneas off on his own adventure – so it would be a lively sea to sail across. Off your ship, there would be a ton of gear opportunities. Above all, though, I’d love to see Ubisoft learn from Just Cause 3 and make a version of that game’s excellent wingsuit. The setup is there, just visit Daedalus to see if he can give you with one of those fancy pair of wax wings he made for his son Icarus – though, it might need a ‘proximity to sun’ meter for that extra layer of authenticity. Jeremy: Of course. Authenticity is baked into the brand. Honestly, it’d be nice just to see another character called Daedelus in a PC game – that’d tickle my Deus Ex nostalgia glands. But what about the Templars? They get everywhere. How do they fit into Greek mythology? Jules: I assume the Templars would be all up in the Trojan conflict. Paris has got to be a Trojan, right? And what about those suitors trying to marry Penelope, that has Templar written all over it. Jeremy: All Ubi need is a wild conspiracy to tie the two together somehow. And something really high for us to dive off. I nominate Mount Olympus.